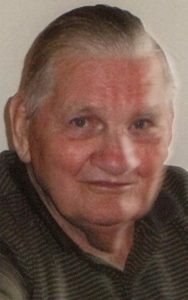 Victor D. Carpenter, 99, a lifelong resident of Lititz, passed away Sunday, March 31, 2019, at Pleasant View Retirement Community, Manheim. Born in Lancaster, he was a son of the late Leon R. and Mae (Demmy) Carpenter. Victor was the beloved husband of the late Anna M. (Dawber) Carpenter, and together they celebrated 67 years of marriage at the time of her passing in 2013. A member of the US Army, Victor honorably served his country during WWII with the 72nd Field Artillery Brigade. A plumber by trade, he worked for several different businesses in the area for more than 50 years, retiring from L & K Plumbing, Lititz. Well into his 80’s, he was still performing plumbing jobs for friends and family. Together with his late wife, they were active with the Lititz Senior Citizens and especially enjoyed going on bus trips. He was a member of Lititz United Methodist Church where he served as Head Usher for many years. Victor always loved family gatherings and picnics, and looked forward to the challenge of a good game of quoits and croquet. Victor is survived by his son Donald and his wife Rosemary of Manheim. Also surviving is a grandson, Travis Carpenter and his wife Tammy of Manheim; a granddaughter, Susanna McFadden and her husband John of Akron; Lori Carpenter, wife of the late Donovan Carpenter, of Manheim; great-granddaughters, Heather Engle, and Destiny, Savannah, Trinity and Violet Green; and a nephew, Robert Carpenter. In addition to his parents and wife, Anna, he was predeceased by his grandson, Donovan Carpenter in 2016, and a brother, Albert Carpenter. Family and friends are invited to attend graveside services which will be held at 2 PM on Saturday, April 20, 2019 at Conestoga Memorial Park, 95 2nd Lock Road, Lancaster, PA 17603, with Chaplain Neal Benedict officiating.